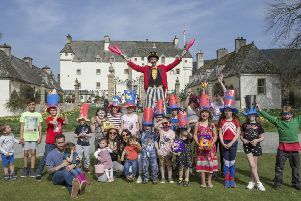 A ten day music festival held in various venues including St Mary's Church and The Town House in Haddington, Pinkie House Loretto School Musselburgh, Prestonkirk Church, Dunbar Church, Garvald Church, Stenton Church, Yester Church, Lennoxlove House, and the Museum of Flight. Performances were by the SCO, BBCSSO, Dunedin Consort, RSAMD Brass Ensemble, Navarra String Quartet, NYCOS, cellist Philip Higham and harpsichordist Mahan Esfahani. and harpsichordist Mahan Esfahani. Photo by John Wood. The Lammermuir Festival is a firm annual fixture in the East Lothian events calendar. The combination of beautiful music in beautiful places attracts audiences locally, from throughout the UK and beyond each year. This year’s festival is from September 9-18, with 10 days filled with 26 performances of beautiful music in 15 venues across East Lothian. Each programme of music is carefully matched to the character and acoustic of its setting, and hearing music in all Lammermuir Festival’s venues is an extra-special experience. At the heart of the festival is the great medieval church of St Mary in Haddington. Nine other churches across East Lothian feature, from the intimate simplicity of the ancient St Mary’s in Whitekirk, to the exquisite Arts and Crafts interior of Chalmers Memorial Church in Port Seton; and for the first time, the Festival visits Glasdsmuir Parish Church. Festival highlights are bound to be the two performances of the community opera Britten’s Noye’s Fludde at 2.30pm and 5pm on Sunday September 11 in Dunbar Parish Church. A colourful cast of over 100 professional, amateur and young musicians, stage crew and school pupils from East Lothian, will be led by Music Co-operative Scotland’s experienced creative team, with international opera star, Donald Maxwell and distinguished conductor, Sian Edwards. A re-telling of the Noah’s Ark story, it contrasts the perils of mass consumerism with the promise of a more sustainable future. Other highlights include Ryedale Festival Opera, presenting its new, fully staged production of Handel’s Alcina. Artist In Residence this year is internationally-acclaimed young pianist, Roman Rabinovich, who performs in recital with superb Dutch violinist Liza Ferschtman. The closing concert on Sunday September 18 in St Mary’s, Haddington is with the Royal Northern Sinfonia, conducted by Lars Vogt, who is also soloist in Mozart’s Piano Concerto No 27 in B flat, K595. To book, see the website or call 0131 473 2000.